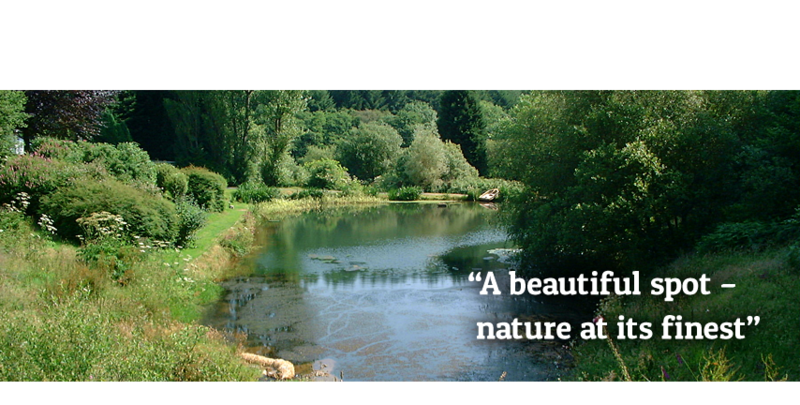 The fishery consists of 5 lakes in a most picturesque setting in 40 acres of rolling Devonshire Heartland countryside. It is mostly in the Bellbrook Valley with the lakes being bordered by woodland and hilly meadows. Five of the lakes are stepped down through the valley with the water cascading from one lake to the next. The 5th lake is in the valley bottom where the Bellbrook Valley joins the Iron Mill Valley. The northern boundary of the fishery is the Iron Mill Stream, a tributary of the Exe with a good head of native browns and breeding rainbows. The fish farm adjoins Iron Mill Lake. There is a wide range of trout fishing available; the lakes are all spring and brook fed and the water is extremely fertile with the adjacent meadow and woodland ensuring a good supply of natural food – consequently there is excellent imitative fly-fishing. This also contributes to the superb quality and excellent tasting pink-fleshed trout. The fishery is open 8:00am to Dusk or 9:00pm (which ever is the earlier) seven days a week all year round. It is not essential to book but it is preferred if you can let us know when you are coming and also ensures that you come on a day when we are not too busy or have an event running. The lakes are stocked with Rainbow, Blue and Brown Trout. The fishery policy is to provide a wide range of fishing difficulty to suit everyone from the beginner to the more experienced. We do this by carefully managing the stocking levels in each of the lakes. We operate a policy of “trickle-stocking” and this way avoid the “boom and bust” fishing that can occur otherwise. Four of the lakes (Bodmin, Dartmoor, Exmoor and Sedgemoor) are stocked with “Normal” fish which are upto 2½ lbs – but there are also a few surprises. The biggest lake - Ironmill - is reserved for the “Specimen” fish which are above 4lbs and run upto very large. Last year the average sizes were 2lb in the Normal lakes and 5½lbs in the Specimen lakes. For more detail on each of the lakes see the following “Lakes” section. Click here to book your fishing.